Unable to cope with the annual influx of slugs and snails, Sharon has welcomed Twiglet and Zoe to the Kitchen Garden payroll with open arms – and it’s the arrival of these two greedy little creatures which makes the garden headlines this month! However, both Twiglet and Zoe will be picking up a pay packet which would make most of us recoil and make a bee-line for the accounts department; for these hedgehogs will be paid in slugs, snails, caterpillars, beetles and other foes of the gardener – great news! Other developments you can read about below are the progress of the broad beans, a real stalwart of the garden and a great early crop; decorative tepee obelisks have joined forces with the runner beans to form a great visual addition to the garden vista and a not bad support for the rampant beans too; Sharon’s broken off from helping Twiglet and Zoe to settle in to set up a great new way of growing carrots; and of course there’s plenty of harvesting activity for you to either empathise with (if you’re growing your own) or be jealous of (if you’re not)! 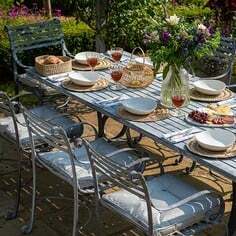 Summer in the garden – if you look past those endless sunny days we have to tolerate – brings its own problems, however. Watering, pests, diseases – all these are topics which have bothered you enough to enlist the help of our Ask the Expert service. E-mail in a query or problem for a direct response, or search through our archives for a solution; either way, we’re here to help. 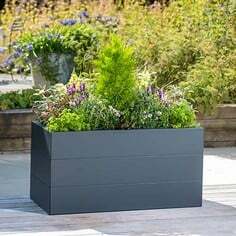 And the popular Garden Forum, also accessible from the links at the top of this page, has a number of interesting posts for your to browse through, as well as covering the current nationwide concern over contaminated manure. And with that selection of literary delights to trawl through, you’ll be almost as busy as Twiglet and Zoe! Ground Hog Day! I’ve making no excuses for using the same title as last month! Our two new Kitchen Garden assistants arrived on the evening of June 16th, accompanied by Lynn Satchwell of Spikes Wildlife Aid Trust. You could say that both Twiglet (he’s a boy) and Zoe (girl) have been dealt a rough hand by life – they’ve both suffered nasty accidents and as a result are amputees – so it’s a nice story that fate has decreed they see out their slug snaffling time in the confines of our Kitchen Garden. Both were due to arrive earlier but Lynn decided that due to their ailments, both would benefit from being introduced in drier conditions. “They tend to drag on the floor,” as Sharon rather succinctly put it! Sharon’s laid on a hedgehog house for them both to bed down in, and she’s also talking care of their garden induction. “They have feeding stations – which in reality are upside-down washing up bowls – which I topped up each day during the first week with dog food and fresh water, and I’m hoping that they will each consume up to 100 slugs and snails each, “ she said with the definite beginnings of a smile! So can anyone welcome a Twiglet and a Zoe into their garden? Well, yes, but you’ll need a visit from hedgehog guru Lynn first. 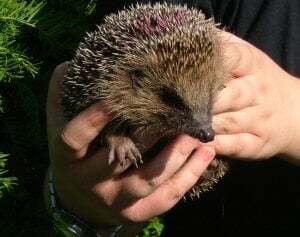 “It’s not just a case of putting hedgehogs into any garden,” she says, “and firstly I’ll need to go and see a potential release site to see if it’s completely safe for our re-habilitated hogs. The last thing we want is a site too near to a road, and it maybe that some remedial work is needed before we can introduce the hedgehogs. It’s a ‘soft release’ process where we help the hedgehogs acclimatise to their new surroundings gradually – they have come from a warm shed after all – and that’s why Sharon will be feeding Twiglet and Zoe at first. These two hedgehogs may well have another 10 years ahead of them (the lifespan of a wild hedgehog is 2-3 years) although we do find hogs with traumatic injuries (Twiglet and Zoe are amputees, don’t forget) may survive for 2 or even 3 years – we have no way of knowing what other injuries they may have sustained.” If you’d like to learn more about the work Lynn and her Spikes Wildlife Aid Trust do, or even ‘foster’ some injured hedgehogs, she can be contacted on 01502 732423; alternatively, visit www.spikeswildlifeaidtrust.com – and keep your eyes peeled for a more in-depth look at Lynn’s amazing work on our blog – coming soon! Broad Smiles! Stand up Witkiem, Hangdown Down Green and Super Aquadulce! A strange assortment of monikers I’m sure you’ll agree, but to broad bean aficionados they’re everyday names. Sharon’s been working hard to both support the beans and boost the pod sizes, and it certainly looks like she’s come up trumps on both accounts – the plants certainly are standing up and they’re literally dripping with huge green pods! Sharon’s used a couple of my old tips for giving the beans a helping hand; watering heavily once the flowers appear and pinching out the tips of the plants before the black bean aphid drops in. 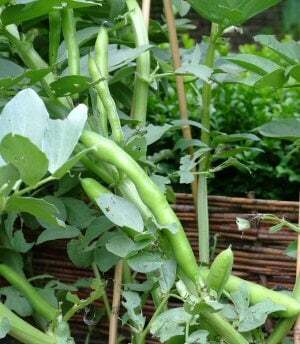 Here’s her take on the 2008 broad bean crop; “I‘ve been harvesting since the second week in June,” she exclaims, “and I’ve pinched out the tops to stimulate growth, watered well whilst flowering and mulched heavily to keep the soil moist. 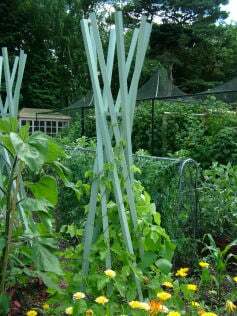 Keeping the beans upright has been achieved with willow edging,” she said. Go West! 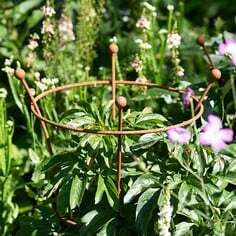 A little part of the Wild West has moseyed on down to the east coast of England withthe introduction of four teepee style obelisks – and it’s Big Chief Runner Bean's tribe who are using these attractive frames for shelter and support! 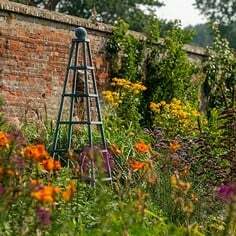 Designed in-house, the obelisks have been planted up by Sharon and the beans are galloping up the structures at a fair old pace. “It’s a bit of an Anglo-French combination we’ve got climbing up the obelisks,” Sharon reports; “From our side of the Channel we’ve planted the runner bean varieties Butler and Enorma, and the French are represented by the climbing beans Barlotta Di Fuoco, Neckargold and Blauhilde.” Sharon confessed to needing a hand assembling these flat packed icons of the Great Plains: “put together with Dave and a drill – fairly easy with two and power”; and she’s also introduced some slug and snail copper tape to each of the eight legs to combat and attempted scaling by our resident molluscs. “The tape is working well,” says Sharon, “and I’ve carefully wrapped it round both the tepee leg and the stem of the beans.” Round ‘em up! The title of a 1962 US top 5 hit for legendary R and B band The Drifters, it’s a lead Sharon has decided to follow in the Kitchen Garden this summer. 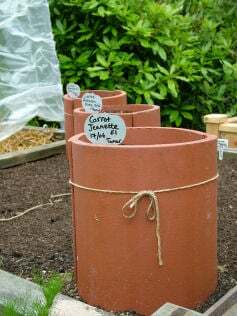 No, she’s not converted the potting shed or greenhouse roof into a growing area, but she has managed to create some rather attractive planters using curved roof tiles – and the carrot crop is likely to benefit decidedly! “It’s an idea I had after hearing of competition carrots grown in drainpipes to enormous lengths,” Sharon explained. “The combination of sandy soil and the depth the old roof tiles will create – I found them in an old shed – should result in nice long carrots!” Whether or not Sharon and her carrots will appear at a local gardening show or fete is yet to be seen, but I can only hope she won’t be singing ‘I Who Have Nothing’ at the end of the season! 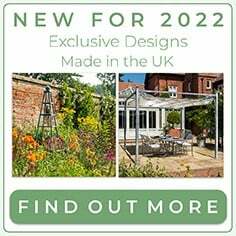 And last month… You might remember from my last e-mail update (subscribe here if you didn’t receive a copy) that Sharon was dreaming of a bumper harvest in the garden this year – and it seems like her dreams are coming true! 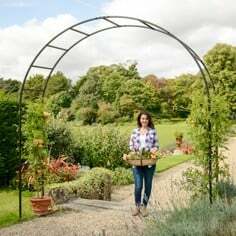 She’s already been picking peas, scrumping strawberries, selecting salads and raiding the raspberries – and she’s even managed to get her hands on a brand new berry picker (ideal for blueberries, blackcurrants, raspberries and a whole lot more)! 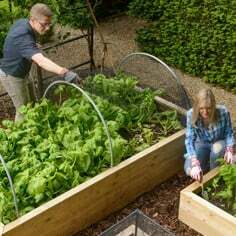 Luckily, the garden hasn’t been afflicted by the contaminated manure scare which is certainly causing havoc in gardens and on allotments across the country; and, as usual, our extremely popular Harrod Horticultural weblog - accessible from the Garden Forum link on this page – carries the story with all the relevant links. Also un-contaminated at present (at least, I think so!) is Dave, Head Gardener of the formal gardens surrounding the Kitchen Garden. As you will have read above, he and his drill have proved invaluable in helping Sharon to assemble her teepee obelisks and aside from his damsel in distress duties, he’s thoroughly immersed in his summer programme of lawn mowing and deadheading. “I’m so glad I’ve got hold of a pair of deadhead snips,” he grinned. 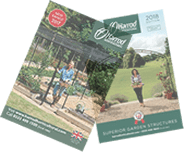 “They’ve made my life so much easier and it’s almost as if they’re an extension of my thumb!” We’ll leave Norfolk’s very own Edward Scissorhands there, but don’t forget to contact me at martin@harrod.uk.com with any gardening views, comments, problems or projects you have on the go!